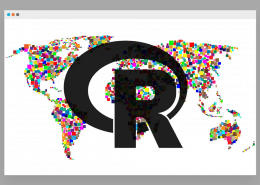 The content of this blog is based on some exploratory data analysis performed on the corpora provided for the “Spooky Author Identification” challenge at Kaggle . The corpora includes excerpts/ sentences from some of the scariest writer of all times. An Hallowen-based challenge  with the following goal: predict who was writing a sentence of a possible spooky story between Edgar Allan Poe, HP Lovecraft and Mary Wollstonecraft Shelley. He is a generalist with a passion for people, data and technology. He has a Master of Science in Electronic Engineering from the Politecnico Di Milano and works as an enthusiast developer with a data scientist twist in the software innovation sector in Statoil. His journey in data science and machine learning started in 2014. The overall data includes 19579 observations with 3 features (id, text, author). 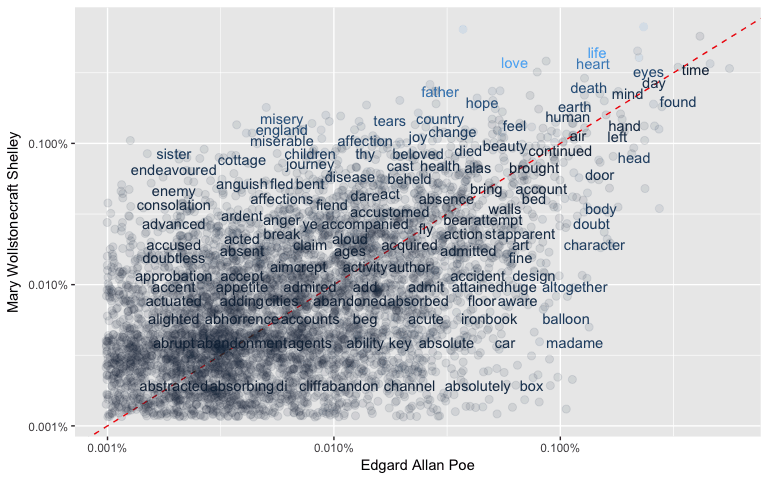 Specifically 7900 excerpts (40.35 %) of Edgard Allan Poe, 5635 excerpts (28.78 %) of HP Lovecraft and 6044 excerpts (30.87 %) of Mary Wollstonecraft Shelley. 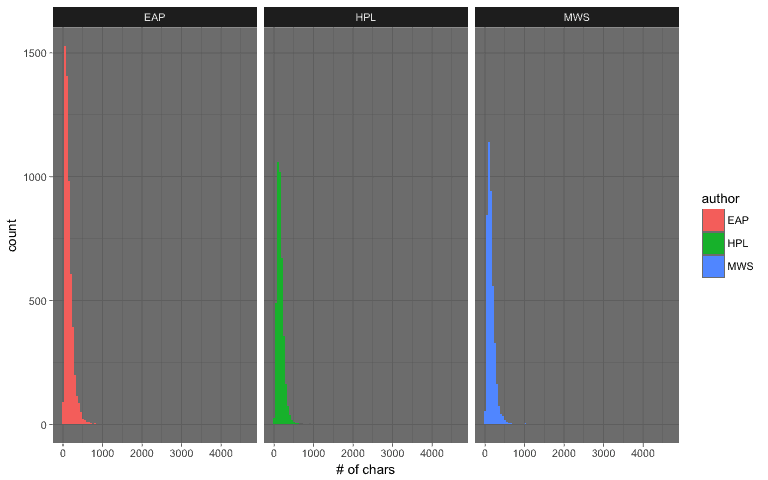 evaluation of the accuracy of our classification model. 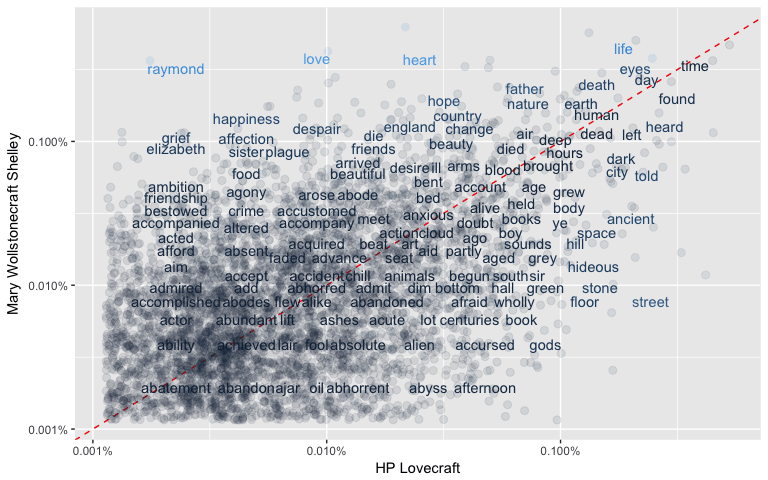 Specifically 5530 excerpts (40.35 %) of Edgard Allan Poe, 3945 excerpts (28.78 %) of HP Lovecraft and 4231 excerpts (30.87 %) of Mary Wollstonecraft Shelley. 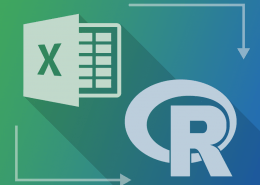 Before start building any model, we need to understand tha data, build intuitions about the information contanined in the data and identify a way to use those intuitions to build a great predicting model. 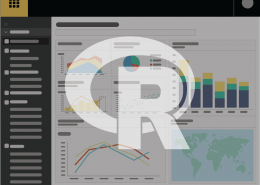 Is the provided data useable? Question: Does each observation has an id? An excerpt/ sentence associated to it? An author? As we can see from the table below, there are no missing values in the dataset. Question: How many excerpts/ sentences are available by author? Question: How long (# ofchars) are the excerpts/ sentences by author? There are some excerpts that are very long. 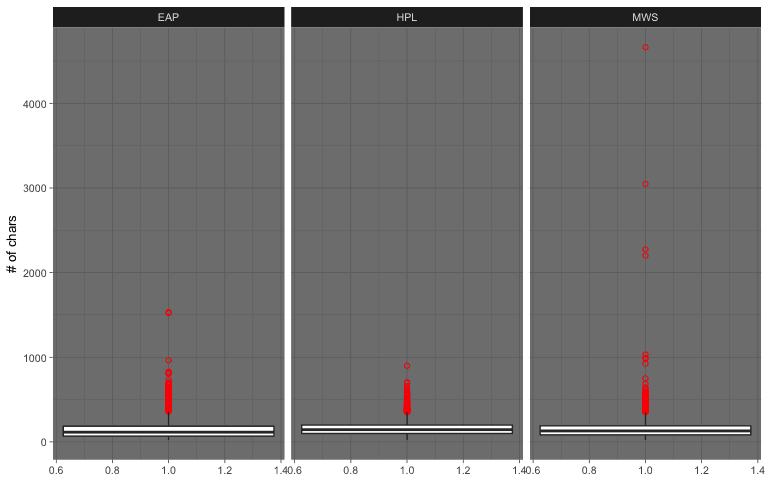 As we can see from the boxplot above, there are few outliers for each authors; a possible explanation is that the sentence segmentation had few hiccups (see deatils below). 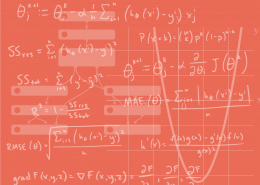 Thinking Point: “What do we want to do with those excerpts/ outliers?”. 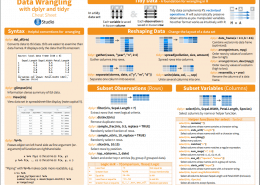 The data is transformed into a tidy format (unigrams only) in order to use the tidy tools to perform some basic and essential NLP operations. 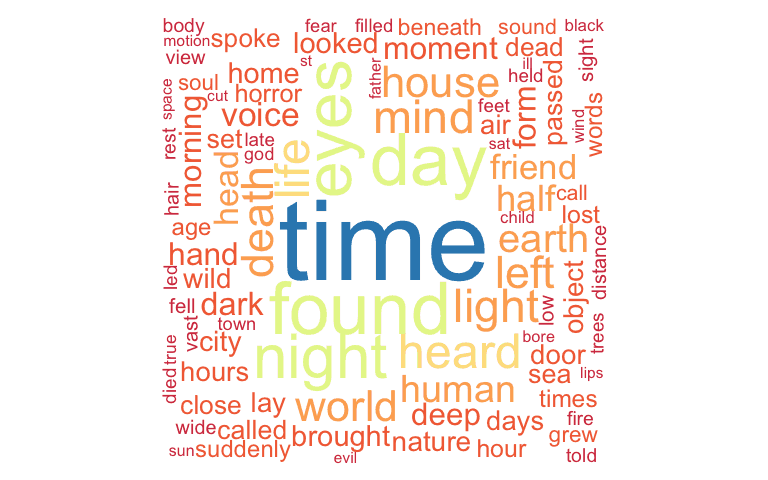 Question: Which are the most common words used by each author? From this initial visualization we can see that the authors use quite often the same set of words – like the, and, of. These words do not give any actual information about the vocabulary actually used by each author, they are common words that represent just noise when working with unigrams: they are usually called stopwords. 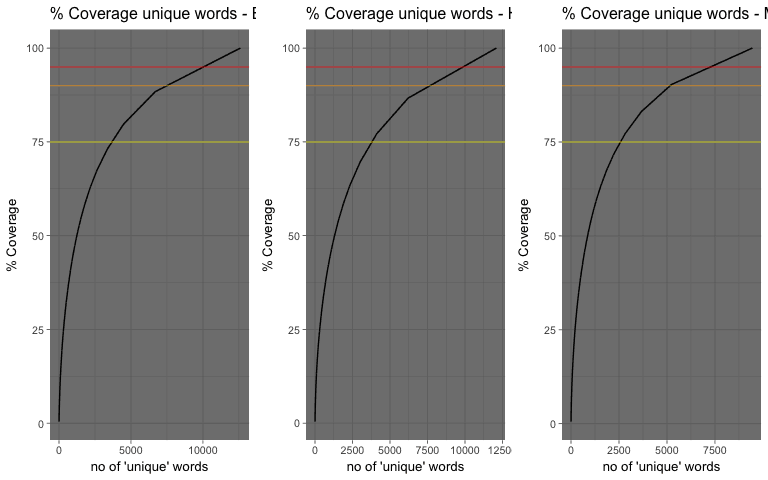 If the stopwords are removed, using the list of stopwords provided by the tidytext package, it is possible to see that the authors do actually used different words more frequently than others (and it differs from author to author, the author vocabulary footprint). 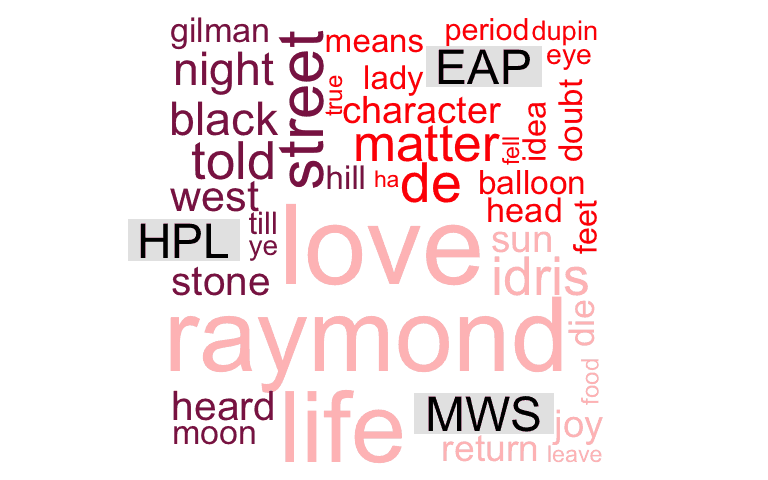 Another way to visualize the most frequent words by author is to use wordclouds. 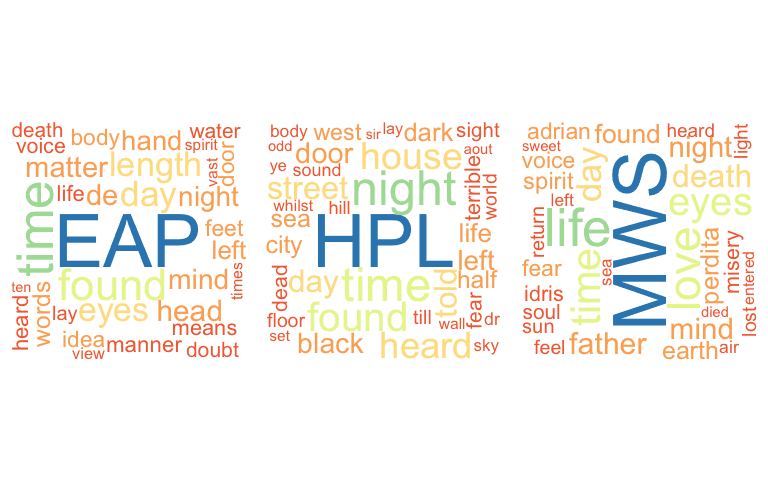 Wordclouds make it easy to spot differences, the importance of each word matches its font size and color. EAP loves to use the words time, found, eyes, length, day, etc. 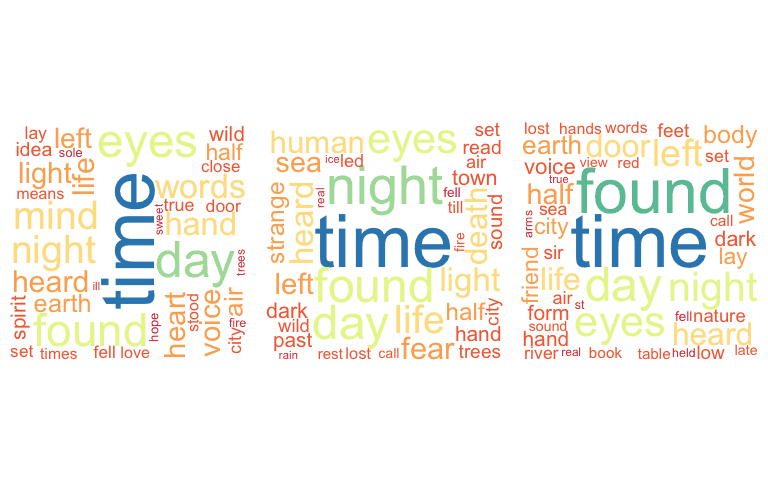 HPL loves to use the words night, time, found, house, etc. MWS loves to use the words life, time, love, eyes etc. 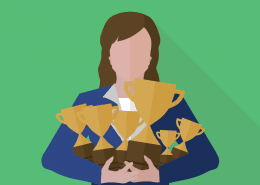 Question: How many unique words are needed in the author dictionary to cover 90% of the used word instances? 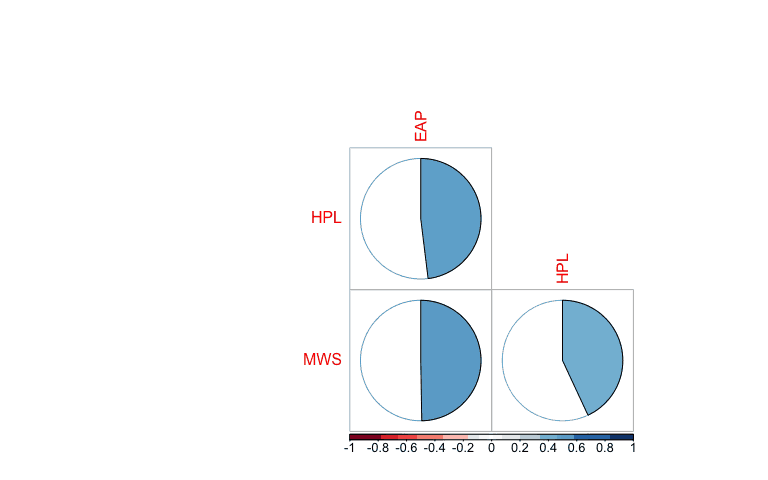 From the plot above we can see that for EAP and HPL provided corpus, we need circa 7500 words to cover 90% of word instance. 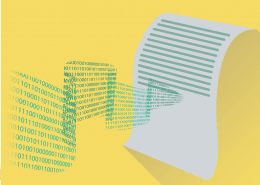 While for MWS provided corpus, circa 5000 words are needed to cover 90% of word instances. Question: Is there any commonality between the dictionaries used by the authors? Are the authors using the same words? 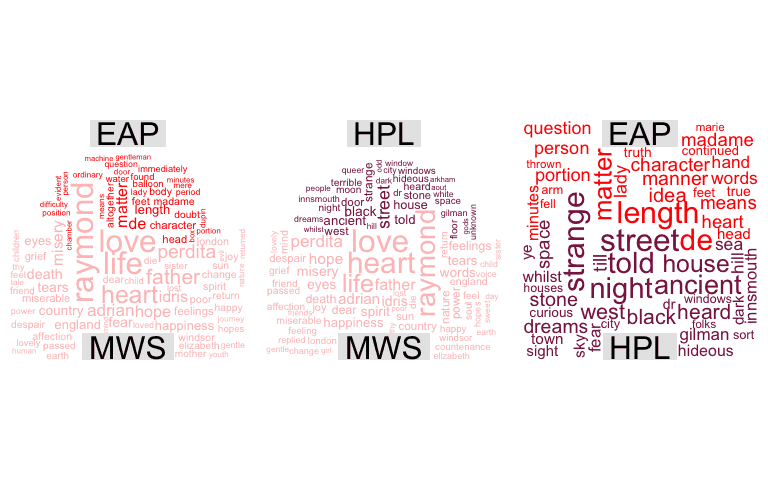 A commonality cloud can be used to answer this specific question, it emphasises the similarities between authors and plot a cloud showing the common words between the different authors. 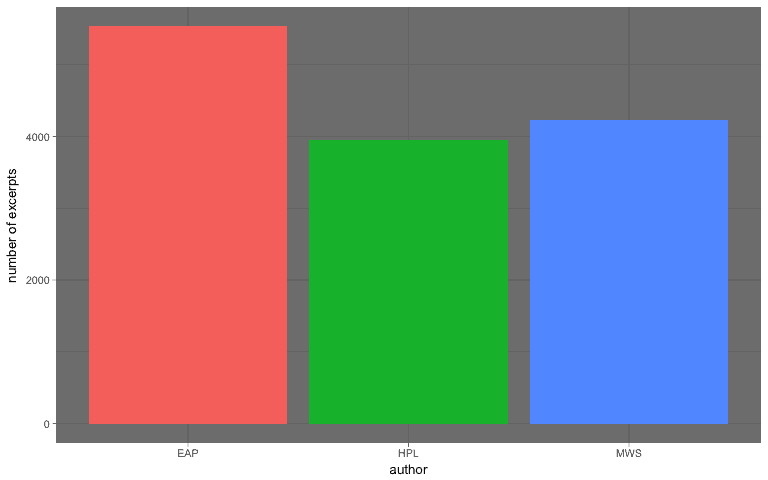 It shows only those words that are used by all authors with their combined frequency across authors. 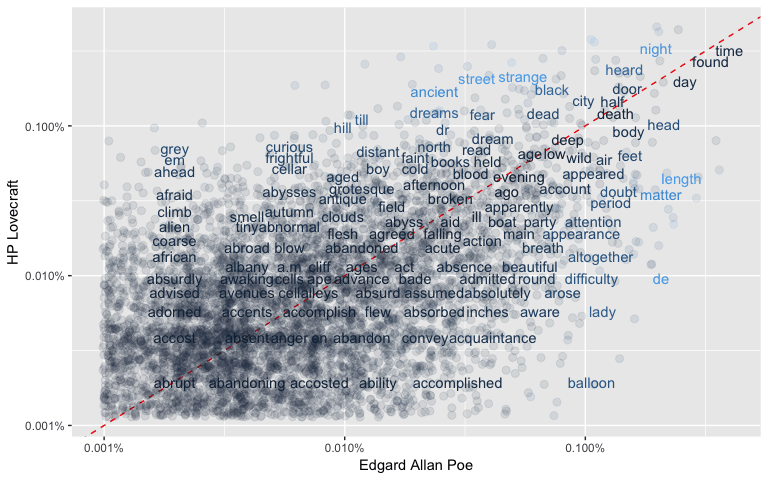 Question: Can Word Frequencies be used to compare different authors? 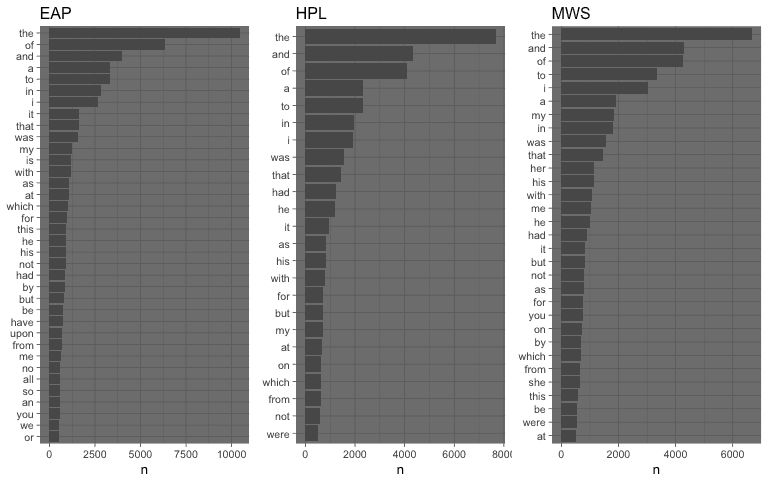 Lets start to plot the word frequencies (log scale) comparing two authors at a time and see how words distribute on the plane. 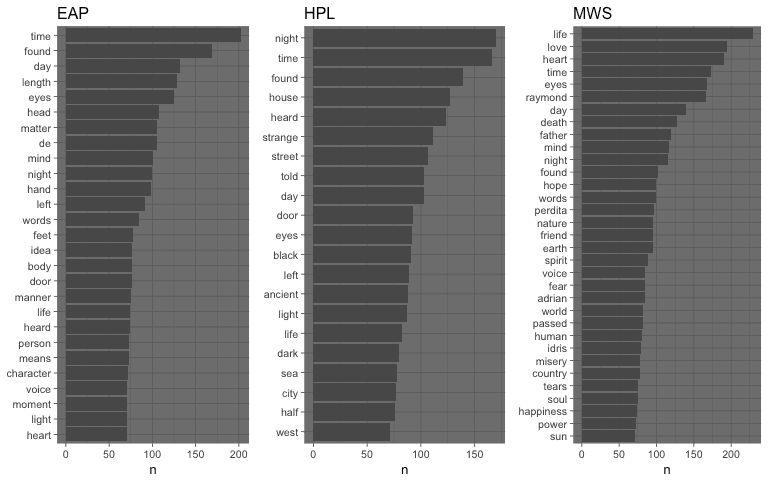 Words that are close to the line (y = x) have similar frequencies in both sets of texts. 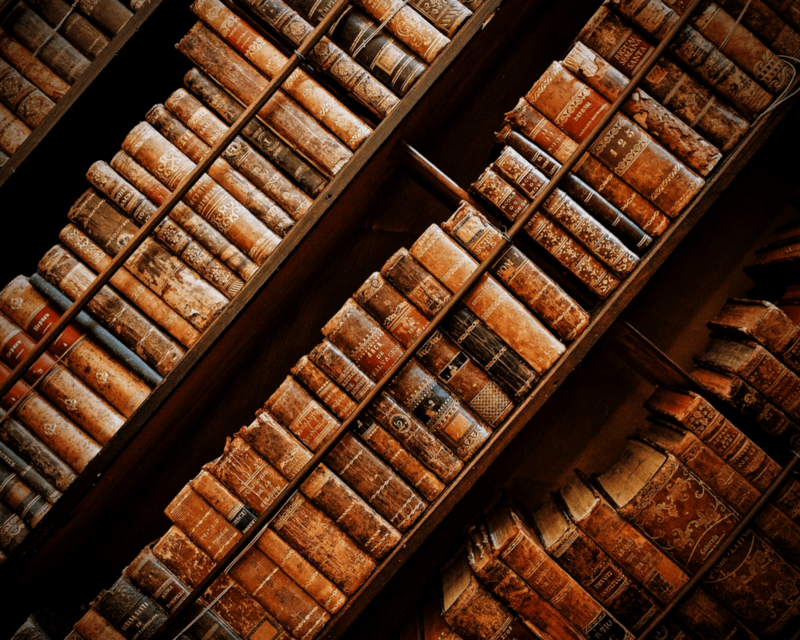 While words that are far from the line are words that are found more in one set of texts than another. As we can see in the plots below – there are some words close to the line but most of the words are around the line showing a difference between the frequencies. In order to quantify how similar/ different these sets of word frequencies by author, are we can calculate a correlation (Pearson for linearity) measurement between the sets. There is a correlation of around 0.48 to 0.5 between the different authors (see plot below). 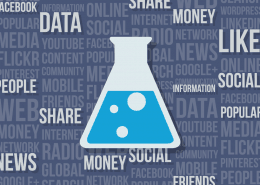 Aspiring Data Scientist? You'll Need Some Math! 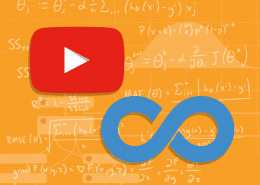 https://datasciencedojo.com/wp-content/uploads/AspiringDataScientistMath.png 800 1000 DaveLanger https://datasciencedojo.com/wp-content/uploads/2016/06/Logo_w300-1.png DaveLanger2017-04-18 13:19:182017-12-13 16:06:05Aspiring Data Scientist? You'll Need Some Math!